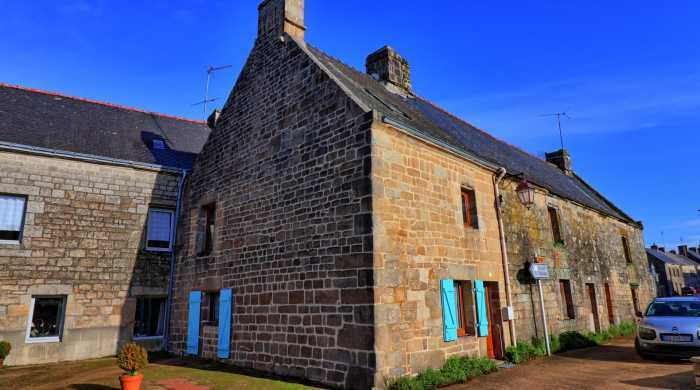 Properties for sale in Brittany, France - AHIB-2-DN-693 Nr Guémené sur Scorff 56160 Pretty lock up and leave home in heart of village. Set in the centre of a large village, just 10 mns away from the popular market town of Guémené sur Scorff, is the great compact village house with plenty of character. The property dates back to around 1850 and was renovated in different stages between 2010 and 2018. It offers on the ground floor a lounge area with beamed ceiling, original character fire place and a wood-pellet burner. Then you have a fully fitted kitchen, a bathroom and toilet, as well as a laundry/work room. A doorway from the kitchen gives out onto a private walled courtyard which is a great sun trap and would be good for Alfresco eating! Upstairs, above the lounge area you have a main bedroom and a toilet with wash basin. Above this is the second bedroom which is presently accessed by a fold down ladder, but this could be replaced with a "normal" staircase quite easily. A great "lock up and leave" property or why not for gite rental? PROXIMITIES Town centre. Shops. Primary school. Supermarket.